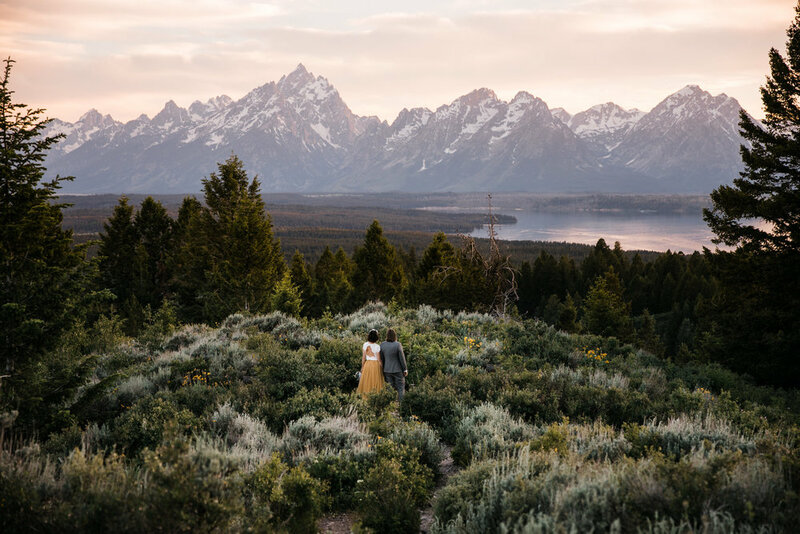 Jennifer and Amanda eloped among the sage brush and towering peaks of the Tetons. 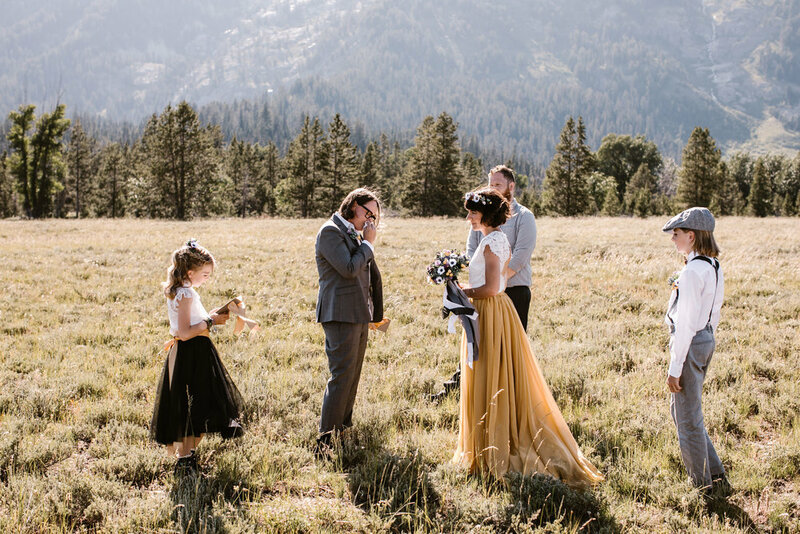 Their kiddos made up the bridal party and their ceremony was one of the sweetest I’ve witnessed. 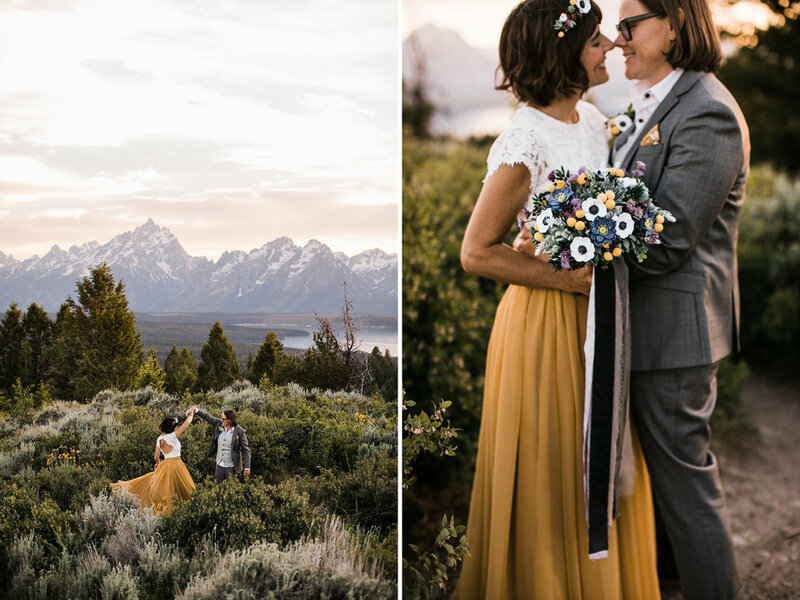 Afterwards we set up camp chairs and enjoyed cake and champagne in a shady field of flowers...it was almost like the Tetons had received the memo that everyone was wearing a dash of yellow and sprouted their best flowers to match. Oh my goodness, I don’t even know where to stay with these two. Honestly, wedding days like theirs are why we love this job so much. 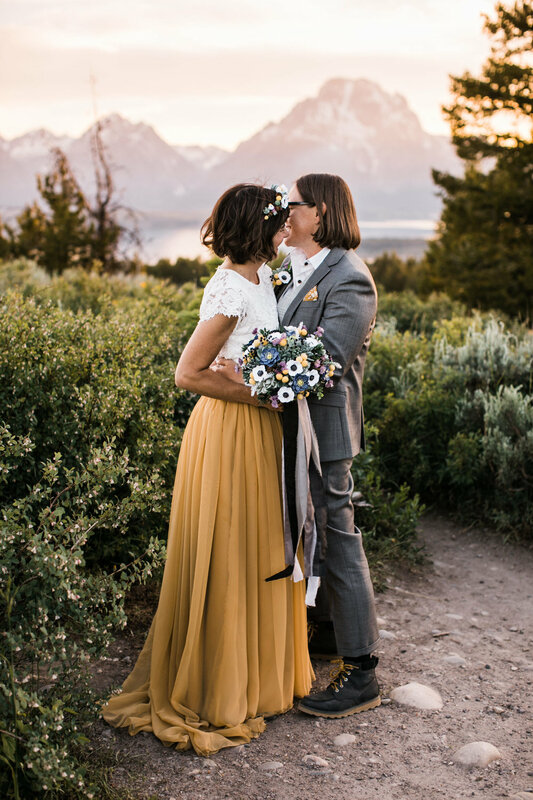 Jen and Amanda met while they were both working for Ikea in Salt Lake City. According to Jen, they connected over their huge passion for Home Furnishing! Since then, they’ve redone just about every bit of their house together. Even in our initial emails back and forth, Jen spoke so highly of Amanda, saying she was her rock, bringing so much stability and constant caring to Jen’s and even her kiddo’s lives. When they’re not working together (which they love, so rare but we totally relate! 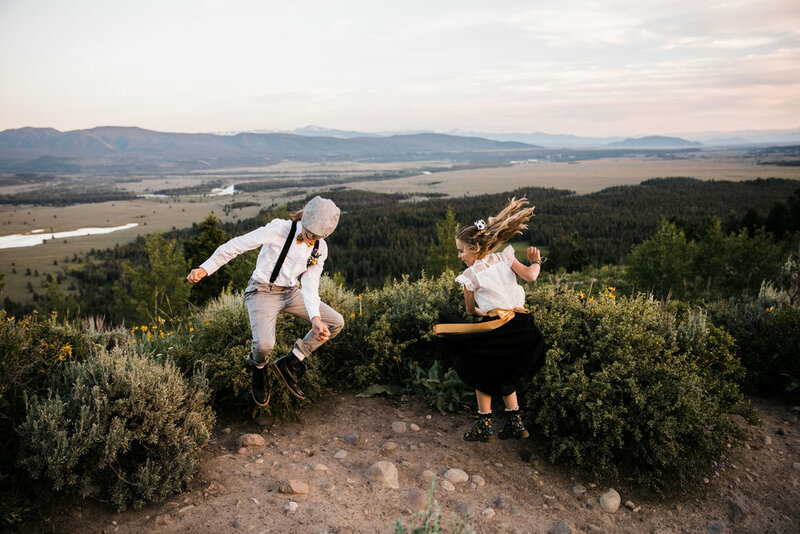 ), they love to do all kinds of outdoor activities around Salt Lake City like hiking, biking, kayaking, camping, and skiing. 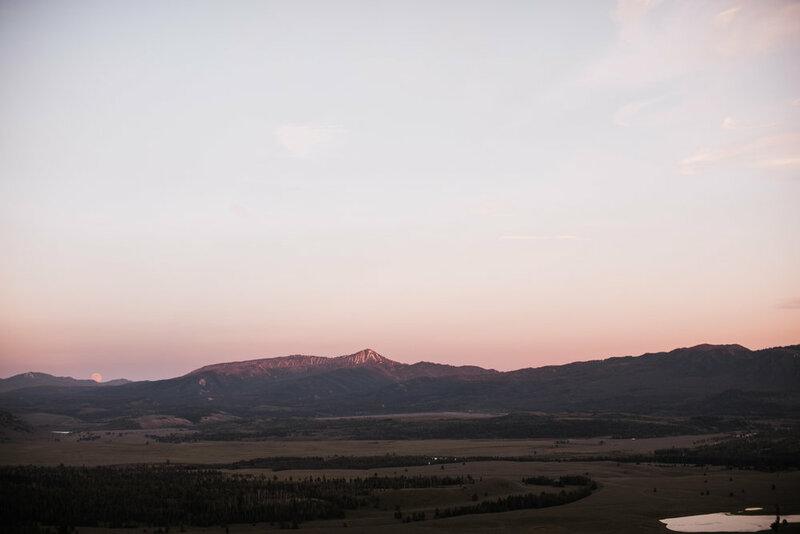 “We got here on Friday of last week and have had such a great time exploring the National Park, it seems unreal. 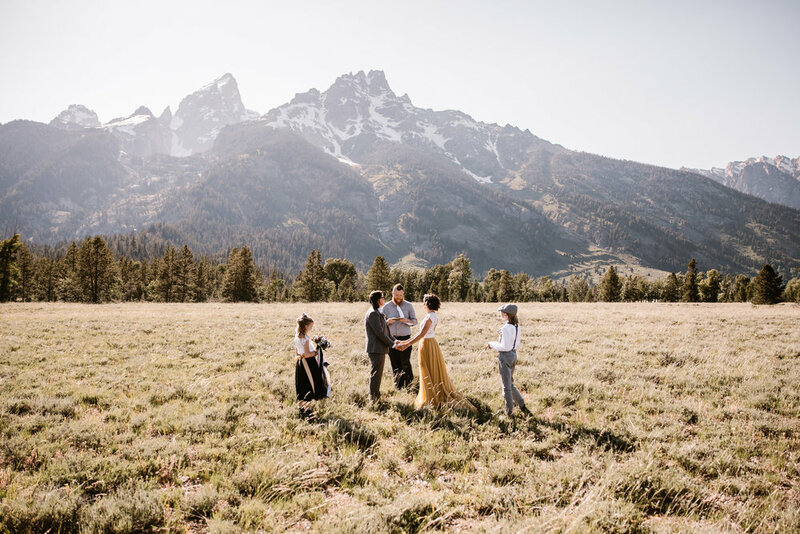 I was thinking a lot this morning about having a wedding here in the mountains and what it means to us, and how nothing could be more perfect or authentic for Amanda and I.
Ugh. You guys. I just really love these two and absolutely love the attitude they had coming into their elopement. 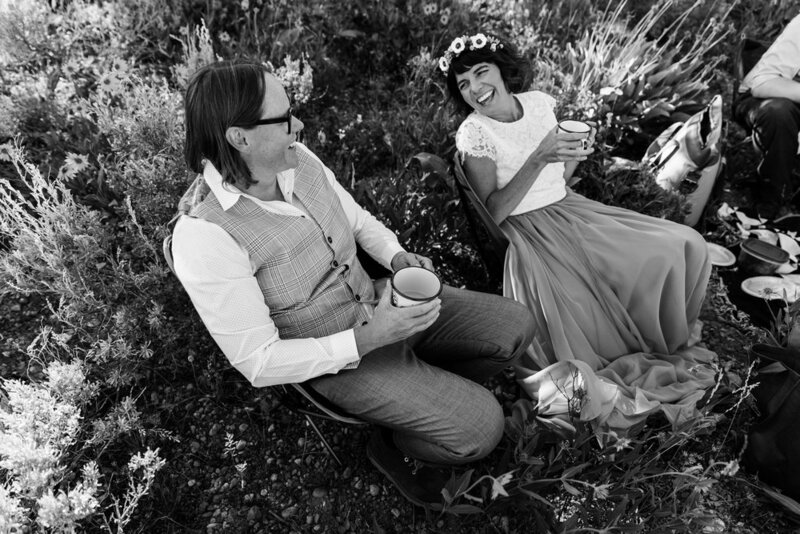 We met up the day of their wedding and wandered out into a field for their elopement ceremony. 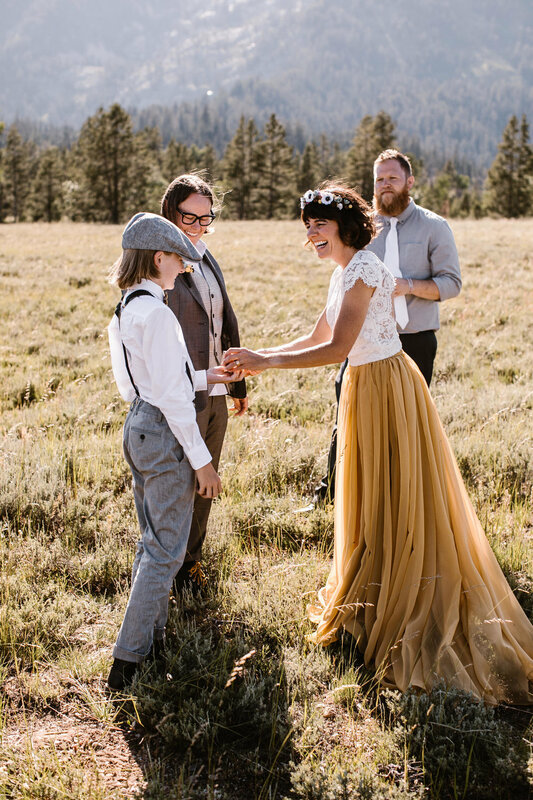 They invited two friends to join, one of which officiated the ceremony beautifully. 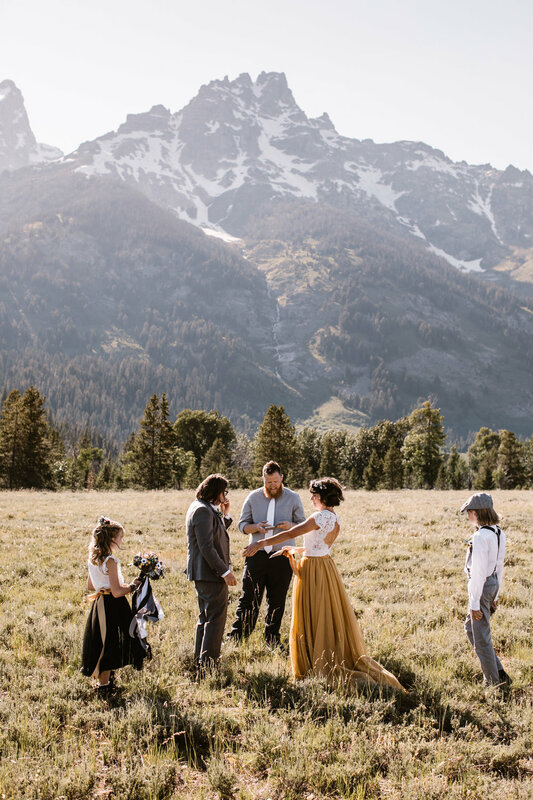 Their wedding was full of so many meaningful details, but one of the sweetest things was how they included the kiddos in their ceremony. I found myself fighting back tears through the whole thing. Afterwards everyone was all smiles, and we made our way to a nice shady spot covered in yellow wildflowers for a little mini reception under the trees. They brought little personal champagne bottles (sparkling water for the kiddos! ), fruit, cheese, crackers, and a delicious cheesecake. 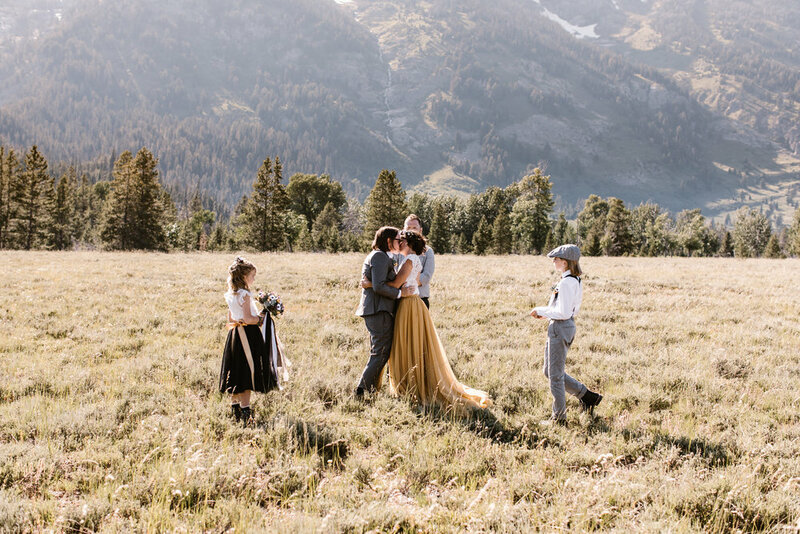 It was the perfect way for everyone to relax and unwind post-ceremony. After we’d had our fill with snacks and bubbly drinks, we headed up to an overlook for sunset portraits. Jen and Amanda both expressed that they weren’t sure they’d enjoy two whole hours of wedding portraits, but I’m happy to report they had so much fun and didn’t feel like they were getting their photos taken the whole time ;) We all ended the day watching the sunset behind the Tetons and the giant Strawberry Moon rise on the horizon. One last thing I want to note - the details and creative vendors involved in Jen and Amanda’s wedding day were amazing. For instance, Jen wanted to make sure they didn’t introduce non-native flora into the park, so she did some research and found an artist in Russia that makes clay flower bouquets and wedding accessories. 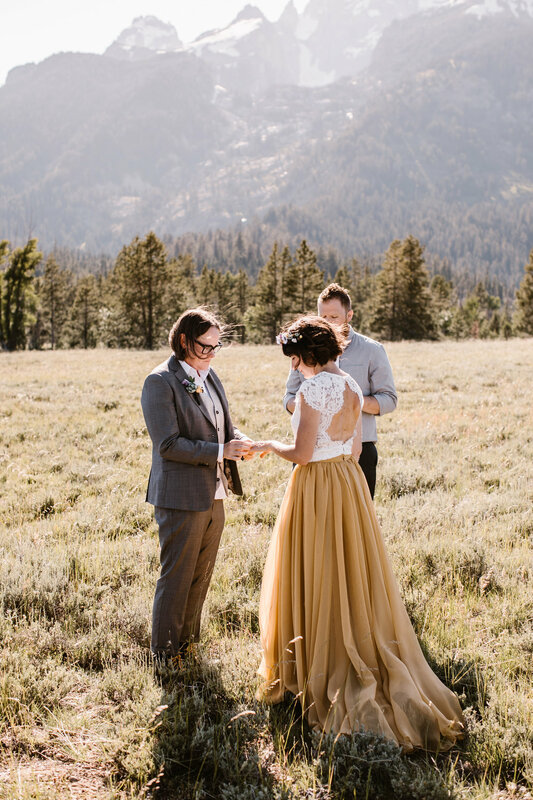 Amanda’s suit was custom made by The Tailor Cooperative, their mountain rings were by Ash Hilton Jewellery, and Jen’s incredible skirt was by Sweet Caroline.